Cease all business operations. 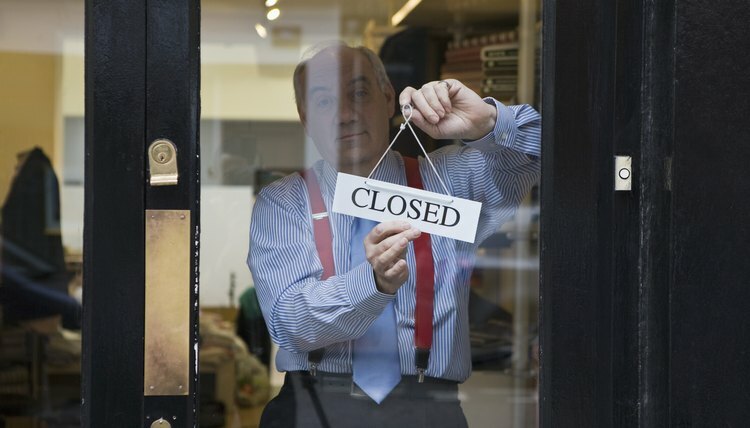 If you own a retail store, set a date to close the doors to customers. Notify employees that the business is closing. Distribute final paychecks to employees, if any wages are owed. File final tax forms, including federal unemployment and income tax returns. Issue final wage and withholding information to employees on Form W-2, and report withholding information to the IRS on Form W-3. Pay off outstanding debts. Notify creditors and lenders that the business is closing and create a plan to settle all accounts payable. Sell business assets if necessary to generate funds to pay off the debts. As a sole proprietor, you are personally liable for unpaid debts, so make sure these liabilities are paid in full. Once this has been done, close your business bank accounts. Cancel any state professional or occupational licenses. Contact the state agency that issued each license to initiate the cancellation, and file any forms required to finalize the process. Cancel local business licenses and permits. When you set up the business, you were required to obtain a business license from the county in which you planned to do business. Contact the County Clerk to cancel the permit. Close state and federal tax accounts, if applicable. If you operated a retail store, you may have a sales and use tax account with the state. Close your state tax accounts by calling the Tennessee Department of Revenue. If you have an Employer Identification Number with the Internal Revenue Service, close the EIN account by submitting a written request to the IRS. Include your original EIN notification letter and indicate the reason you are closing the account. Cancel your assumed business name, if you applied for one. Tennessee sole proprietorships are not required to register fictitious business names, but you may have done so when you started your business. Visit the Tennessee Department of State website and click on "Corporations" under "Business Services." Click on "Forms and Fees" under "Corporations" and download the Application for Cancellation of Assumed Name. Complete and submit the form with the required fee. Maintain financial records. The IRS and the state may audit your business records and employer information for three to seven years after dissolution of your sole proprietorship. Compared to other business structures, sole proprietorships are relatively straightforward to set up. A sole proprietorship only has one owner who assumes liability for the business's debts. Opening a sole proprietorship involves selecting a business location, registering its name, applying for licenses and permits, and registering to pay taxes. Although uncomplicated, it is essential to set up a sole proprietorship correctly so as not to incur jurisdictional fees or penalties.